Gastric colonization with Helicobacter pylori in the human host has been associated with many extragastric diseases. We want to demonstrate that H. pylori colonization is associated with the dermatological disease Chronic Idiopathic Urticaria (CIU) and after bacteria eradication patients have clinical improvement, for this, 60 patients with CIU diagnosis were studied. Baseline and 6 weeks after therapeutic intervention. H. pylori status was established by UBT-C14 and ELISAs anti-CagA protein and Whole-Cell (WC) antigens. Our results shows that 44 (73.3%) patients were at base line UBT-positive and 16 UBT-negative, no statistically significant differences were founded in age, gender and duration of disease. No correlation between H. pylori density (UBT DPM mean value) and symptoms severity was found. Serology correlated in 97.7 % of UBT-positive patients and only 11.4 % were false negative for H. pylori in both WC ELISA and CagA ELISA. A significant decrease in WC OD net values was observed in the UBT-positive patients with clinical improvement after H. pylori successful eradication compared with UBT-negative patients (p<0.05), but not for CagA OD net values. Severity of symptoms showed a correlation with increasing OD values of WC and CagA in the UBT-negative group (p>0.05). Clinical improvement was associated with changes in the WC OD net values in the UBT-positive patients after eradication (p<0.05). Our conclusion is that the successful eradication of H. pylori is correlated with clinical improvement, but not with the severity of the disease. These findings strengthen the role of H. pylori in the maintenance of CIU disease. Urticaria is one of the most common dermatologic problems seen by primary care physicians and often a source of frustration for patient and specialist in the Dermatology Service. This disease usually presents as raised, erythematous wheals accompanied by intense pruritus, and the lesions typically last a few hours, only to fade and reappear elsewhere. The atopic pathway mediated by Immunoglobulin E (IgE) which is one of the classical mechanism to explain the development of this disease, with a marked Th2 immune response, and its related to other allergic disease such as asthma and angioedema [1,2]. Chronic urticaria (symptoms persist for more than 6 weeks) is twofold higher in women than in men [3,4]. Although it occurs more often in adults, it can affect all age-groups. No racial predilection has been identified. Recently, an association between chronic urticaria and the major histocompatibility complex allele, HLA-DRB1*04, was identified. This association suggests that disease may involve an interaction between genes, the environment and the immune system similar to that observed in asthma and coronary artery disease . When urticaria turns chronic and an exhaustive study doesn’t find a probable cause, it becomes Chronic Idiopathic Urticaria (CIU), and its association with several diseases have been described, included infectious diseases and some carrier condition of specific microorganism [2,5]. The medical priority in CIU patients is the symptoms control, because the treatment doesn’t have define etiologic cause to focused . Helicobacter pylori is one of the most frequent bacteria found in humans, and some authors proposed considered as human normal flora against the classical concept of pathogen. The bacterium colonizes the human gastrointestinal tract and its related to the development of several pathologies including chronic atrophic gastritis, peptic ulcer disease, gastric MALT lymphoma and distal gastric adenocarcinoma [7,8]. The eradication of the bacteria in patients with gastric diseases is associated with clinical and histopathological improvement, and in some case with total recovery of health in selected diseases. The current concepts leads to the pathogenesis mechanism of H. pylori related with the production of CagA protein (mediated by cytotoxin-associated gene cagA) and vacuolating cytotoxin A (mediated by vacuolating cytotoxin gene vacA), the strains that expressed the two genes are considered more pathogenic (produce more inflammatory response) in opposition to the CagA-negative strains [9,10]. The CagA positive status has been considered a marker of good prognosis in response to the eradication therapy [9,11-13], but is linked to an increase risk of neoplasic pathology [14-16]. A study of Shiotani et al., shows that H. pylori colonization can be used as a marker of early risk in gastric cancer in patients with pruritic skin diseases (especially cutaneous pruritus and prurigo chronicmultiform) . Few years ago, H. pylori begins to be related with an increase number of pathologies outside the gastric tract, the first reports came of casual observation in the improvement of bronchial asthma with the use of proton pump inhibitors and leads to the subsequent study of the association of H. pylori in these patients, and the clinical improvement with the eradication of the bacteria . Similar findings were observed in dermatological pathologies as Schönlein-Henoch purpura, inflammatory rosacea, prurigo and chronic urticaria [19-22]. In addition, another association was made in diverse diseases such as a glaucoma, pancreatic cancer, infant sudden death syndrome, even cardiovascular diseases as atherosclerosis or stroke [23-27]. Nearly 25% of the population under 50 years could have a potential urticaria episode in its lifetime, that could progress to chronicity with the disability and distress that can lead to serious impairment of quality of life, almost comparable to that experienced by patients with cardiovascular disease [3,28]. This disease is a serious problem, especially when treatment of a disease of unknown etiology is symptomatic and in the most of the cases, prolonged and probably for the rest of the life, with the complications that a therapeutic regimenmay leads after a prolonged use [29,30]. Since 95% of the urticaria disease still without a specific etiological cause (idiopathic), and is considered as a syndrome. H. pylori has been suggested as probably etiology of CIU in the order of 5-10% of know causes after exclusion of other causes (physical, allergic, contact, weather associated [29-34]. There are some evidences linked H. pylori with CIU, the first one is the cause-effect model that postulates H. pylori colonization as responsible for the development of CIU and the improvement of clinical CIU with the eradication of the bacteria [22,33-36]. The opposite side of this model is supported by some authors’ experiences others considered H. pylori presence in the patient with CIU as an epiphenomenon or co-morbidity condition associated to the highest seroprevalence of the bacteria in the general population [37-46]. In Venezuela exist a high H. pylori seroprevalence (75%) in the adult population, that is similar the rest of the developing world . Preliminary unpublished data of the main author on CIU patients reveals a similar prevalence of the bacteria as in the general population, but with an excellent clinical improvement of the CIU symptoms after the successful eradication of the bacteria, compared with patients that were not treated [37,48]. In the extra-gastric diseases that are currently associated with H. pylori does not exists sufficient evidence to implicate the CagA status, and the present data are confused and in some cases controversial or inexistent . Current study encounters some limitations. First, the sample size is relatively small so bias may still exist. Second, there is no matched control group for this study which should be untreated from H. pylori infections. Based on the non-conclusive evidence of causality among H. pylori gastric infection & CIU, the present study investigated if chronic H. pylori gastric infection in the human host is associated with CIU and its clinical evolution in Venezuelan patients and try to demonstrated that eradication of the bacteria is linked to the clinical improvement of CIU. We studied 60 patients with chronic idiopathic urticaria diagnosis from the Dermatology Service of Jose Maria Vargas Hospital of Caracas, in Venezuela. Among them were 42 female/18 males (female/male ratio 2,3); mean age 39,45 years±13 (range 13-73). Patients were enrolled from January 2002 to September 2003, and signed an inform consent form (approved by Bioethics Committee of Instituto de Biomedicina Dr. Jacinto Convit, Caracas, Venezuela). Patients were included in this study if they were diagnosed with CIU, defined as raised, erythematous wheals, intense pruritus for at least 6 months and without an identified cause after excluding all other common causes of urticaria. Patients were excluded if they have been treated with antibiotics (Penicillins, Macrolides, Tetracyclines, Metronidazole), in the previous two months of the study; or if they were treated with proton pump inhibitors, histamine antagonist of H2 blockers, or bismuth subsalicylate in the previous two months of the study. Pregnant women and patients with any type of immunosuppression including positive HIV infection were excluded. Breath samples for the diagnosis of H. pylori were collected at first visit and in the follow up visit (7 weeks after), using a commercial Urea Breath Test C14 kit (Pytest®, Ballard Medical Products, Lone Park, USA). Positive values were considered up to 200 DPM (Disintegrations per Minute), values between 51-199 DPM were considered indeterminate (repeat the test) and negative results were considered when the value was ≤ to 50 DPM. The process of the breath samples was realized by Endomedica CA (Caracas, Venezuela). Blood samples were collected at baseline and follow up visit (7 weeks after). The blood samples were centrifuged at 10000 RPM for 10 minutes and serum was separated and storage in Eppendorf tubes (6 tubes per patient/1,5 mL sera per tube), and frozen at-20oC. The serum samples were transported to the infectious diseases laboratories of New York University School of Medicine, New York, United States in a special refrigerated container. The H. pylori-UBT positive group received triple eradication therapy against H. pylori for seven days with Amoxicillin McKCalox® (Calox Laboratories, Caracas, Venezuela), caps 500 mg (1 gr/PO/BID) plus Clarithromycin McKCalox® tabs 500 mg (500 mg/PO/BID) plus Proton pump inhibitor-Omeprazol McKCalox® caps 20 mg-(20 mg/PO/BID). For the symptoms of urticaria, Loratadine McKCalox® tabs 10 mg was prescribed for one week (10 mg/PO/daily). The control group (H. pylori-UBT negative) only received Loratadine (McKCalox® tabs 10 mg) for one week (10 mg/PO/daily). We designed three different scales, one to evaluated and classify the severity of symptoms at baseline and follow up visit (symptomatic categories) the second to compared the clinical response before and after the therapeutic intervention (response categories), and the last one to analyze the data basis on the summation values of the severity of symptoms scale at baseline evaluation (initial score) (Tables 1 and 2). The H. pylori WC and CagA ELISAs were performed as previously reported [14,50]. In brief: An Enzyme Linked Immunosorbent Assay (ELISA) was performed, first coupling the antigens to the plastic plates at a concentration of 250 ng/well in carbonate buffer for CagA antigen and 1 µg/well for H. pylori WC antigen with overnight incubation at room temperature. Then blocking the unspecific binding sites with 200 µL of PBSTTG and incubate for 3 hours at 37oC, washing with PBSTT 250 µL/well for 3 times. The incubation with the primary antibody required a dilution of 1:100 for CagA antigen and 1:800 for WC antigen; we using positive control at dilution 1:100 for CagA and for WC antigen at dilution 1:7500, the negative control was diluted 1:100 for CagA and 1:800 WC. 100 µL of each dilution where loaded in the plate and incubating for 1 hour at 37oC, and washing with PBSTT 250 µL/well for 4 times. The incubation with the secondary antibody peroxidase labeled (Goat anti human IgG) required a dilution 1:4000 in PBS/BSA and the load of 100 µL of it per well with incubation for 1 hour at 37oC, then washing with PBSTT 250 µL/well for 4 times. The color development reaction using a freshly prepared developer (Na2HPO4 0,2 M+Citric acid 0,1 M+ABTS+H2O2) solution was added at 100 µL/well as a green color appears and proceed to read in ELISA reader at 405-450 nm. Each sample was tested in duplicate in two different days and the mean value of those determinations was accepted only if the results were concordant (both positive and both negative). In case of discordant values, the samples with the discordant results were tested for a third time. In a second phase, we performed a new ELISAs in which we diluted 10-fold the serum samples. We tested dilutions for CagA antigen (1:100; 1:200 and 1:400) and for WC antigen (1:500; 1:1000; 1:2000; 1:4000; 1:8000 and 1:16000) on PBSTTGG, and calculate the Optic Density net values (OD net) subtracting the post-treatment value from the pre-treatment value. Data were presented as means±SEM and ranges. Differences between groups of patients were tested using Chi square test, Fisher’s exact test and U-test of Wilcoxon-Mann-Whitney and differences between data at different dilutions were tested using Wilcoxon-Wilcox test. The analysis of variance and ANOVA test for non-parametric data was used to confirm the tendency presence in the serological response evolution. P < 0,05 was considered as significant. The computer software used to perform the statistical analysis were Microsoft Excel 2003®, Epi Info 2000® version 1.1.2 and GraphPad Software, InStat guide to choosing and interpreting statistical tests, 1998, GraphPad Software, Inc., San Diego California USA. A group of 60 patients was divided by UBT results in 2 subgroups: 44 H. pylori-positive patients (70.4% female) and 16 H. pylori-negative patients (68.8% female) (Table 3). No statistically significant differences were founded in age, gender and mean duration of disease. The mean values of OD for WC and CagA were as expected higher (almost three times higher) in the H. pylori-positive group than in the negative group. The mean value of Disintegrations Per Minute (DPM) for the UBT, was also higher in the positive group when comparing with the UBT negative group. We used the results of UBT as the gold standard criteria to define H. pylori status. A comparison between serology results and UBT results were made before the therapeutic intervention, 97.7% of UBT-positive patients have a similar result that correlated with serology (WC & CagA+, WC+/CagA-and WC-/CagA+). There was only one patient with positive UBT but false negative for H. pylori WC and CagA ELISA. Among H. pylori positive, 4 (9.1%) of those patients were positive for CagA ELISA only, suggesting that they have immunological memory for the dominant CagA antigen of H. pylori. In contrast, only 5 (31, 3%) of UBT-negative patients shows concordance in the serology (WC & CagA negative). Furthermore, we observed 7 patients that (43.7%) were only positive for CagA. Next, we try to establish an association among the severity of the clinical presentation for CIU and H. pylori infection. We did not observe any correlation between the mean values of disintegrations per minute in the UBT (as an indirect expression of density of H. pylori colonization) and the severity of the clinical presentation. In the H. pylori-positive group, mean WC OD value shows a slightly high value in the mild to moderate symptoms subgroup compared with the severe symptoms subgroup (Table 4). Among CagA OD values, we did not find an important variation related to the severity of symptoms. For the H. pylori-negative group, the subgroup with mild to moderate symptoms has higher values for WC and CagA compared with the subgroup of severe symptoms. After therapeutic intervention, we compare the number of patients that shows improvement of CIU symptoms and H. pylori serologic patterns (Net OD values) for WC and CagA. For the UBT-positive group we find a statistically significant difference in improvement associated with a decline in the WC OD net values as compared with the UBT-negative group (Table 5). The improvement tendency keeps for the CagA OD net values, but not statistical significance was observed. An effective decline of the immune response against H. pylori WC antigen is associated with the development of clinical improvement after the eradication of the bacteria. In the H. pylori-positive group, UBT values showed a declined with the clearance of the bacteria in all the patients, and these results correlated with clinical improvement. However, there was not a significant change in the serological response; patients still had elevated OD values may be due to the recently eradicated bacteria (Table 6). Among H. pylori-negative group an interesting increased in the WC and CagA OD values was observed in patients in whom symptoms changed from asymptomatic to severe, and this increase was statistically significance and contribute with additional evidence for a possible role of H. pylori in the maintenance of clinical symptoms of CIU. We also noticed that all the UBT-positive patients show some grade of clinical improvement, versus only 3 apparently spontaneous cases of improvement in the UBT-negative group (p<0.0001 FET). Among the H. pylori-negative group we observed not variation in the CagA OD values, but only a slightly tendency to decrease in two patients. 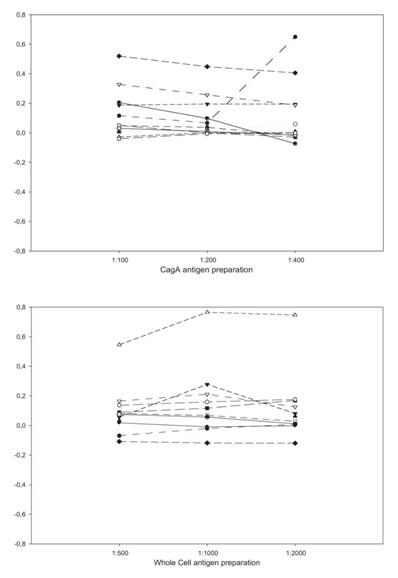 For WC antigen preparation, the results were more stable (Graphic 1). It can be explained by immunological phenomena of polyclonal response in a disease with important allergic compounds as CIU, and when the increase of total IgE levels expressed a systemic inflammatory process; and when we compared the OD values against the severity of the disease, these shows an increase as major is the magnitude of the symptoms, in opposition to the observations at the baseline moment (Table 7). The H. pylori-positive group showed decreased of >50 in the WC OD values and similar results for CagA OD values between the asymptomatic patients and the group of moderate symptoms (Graphic 2). In this group with the lowest symptoms the seroconversion phenomenon and the tendency to the response of its kind were observed. A number of studies in several countries showed the high prevalence of H. pylori infection in CU patients, followed by clinical remission of CU after H. pylori eradication therapy. In the first one of these studies, back in 1994, Kolibasova et al. , assessed 21 patients with chronic urticaria and H. pylori infection. Eradication therapy against the bacterium led to remission of urticaria in 95% of the cases. Later on, Bohmeyer et al. , in 1996, carried out endoscopic assessment in 10 patients with CU, finding H. pylori in the gastric mucosa in 8 of them; they reported that the skin lesions disappeared within a few days of treatment with amoxicillin and omeprazole. The lack of structured case-control studies with a strictly follow up and evaluation of active infection and serological response at baseline and after treatment, contributed to the absence of evidences that could demonstrated a possible association between H. pylori colonization and the development and evolution of extragastric disease. In addition, the pathophysiological mechanism that could explain the action of the bacteria as a producer or modification in these diseases still unclear. Our initial observations in the patients with CIU reveals an H. pylori seroprevalence similar to the rest of the population (73,3%), and it can be associated to an early acquisition of the bacteria well described in the developing countries as Venezuela . CIU is at least twice as common in our female patients that in the male, in concordance with the literature reports, independent of the presence or not of the bacteria [1-5]. Both groups had similar characteristics (mean age, duration of disease, gender ratio), and the UBT shows mean values that permit separate without doubts the two groups. Serological values at baseline evaluation were higher in the UBT-positive group as in UBT-negative group, but interestedly the CagA OD value is higher than WC OD value in this group, it can be an expression of the immunological background of a complicated and multi-factorial disease as such CIU with important inflammatory compounds included. UBT looks as a good non-invasive test to discriminate the gastric presence of H. pylori in the human host, and when we correlated with serological test as IgG anti H. pylori WC and IgG anti CagA, UBT appears with some advantages in the early determination of bacterial eradication. The triple therapy employed for H. pylori eradication in the UBT-positive patients that include amoxicillin plus clarithromycin and omeprazole was successful in the 100% of the cases and well tolerated for the seven days of duration. The use of loratadine in the UBT-negative group neither shown complications. In H. pylori-positive patients (UBT-positive) baseline ELISA for CagA looks more reliable than WC serology, but when we analyzed the association of the mean OD net values for both serological markers in this group after the eradication therapy, did not find a strictly correlation. In the H. pylori-negative patients (UBT-negative), both WC and CagA serological tests showed poor specificity (75% and 31% respectively), but when we stratify the symptoms severity and related with the mean OD net values for WC and CagA, the results after the 6 weeks of baseline evaluation shows parallel increase of both markers with the increase in the severity of the disease. When we compare with the UBT-positive group that did not show this behavior, maybe because the higher levels of antibodies in response to an actual infection did not have faster variation as the changes that we observe in the UBT-negative patients. The H. pylori-negative patients maybe have a polyclonal response related to its primary pathology (of unknown etiology) and the atopic pathway of IgE total participates in the unspecific response against different antigens. These observations support the original idea that H. pylori is associated with CIU, maybe as a maintenance factor than as a trigger. The important changes (>50%) in the H. pylori WC OD net values in the UBT-positive patients after the eradication therapy and negativity of UBT results are associated with clinical improvement that goes in almost the 50% of this group to the total improvement of symptoms (clinical cure), and it is the expression of an effective immune response (P<0, 05); in the CagA case, the diminutions are presented, but not in the same magnitude than the observed for WC. Fukuda and his colleagues (2004) found a high incidence of CagA expression in Chronic Spontaneous Urticaria (CSU) patients (100%, 13/13) and similarly in control group (100%, 26/26) . Yi-Chun Chiu et al., in a longitudinal follow-up (range 12-29 months, median 23.5 months) showed complete remission of urticaria in 63.6% (7/11) and no improvement in 36.4% (4/11) of our patients after H. pylori eradication. In addition, they had shown that the expression of other virulence factors did not differ between patients with and without CSU [53,54]. If we put together the clinical findings of improvement of CIU symptoms after the eradication of H. pylori, the really absence of improvement in the UBT-negative group (with the exception of 3 cases that shows “spontaneous” improvement), the findings of completely changes in the UBT mean values after eradication therapy expressing an 100% of successful eradication and related to changes in the clinical presentation of the disease, the interesting fact of higher values for WC and CagA OD net values in the UBT-negative patients correlated with higher severity of symptoms, all this points strengthen the H. pylori role in the maintenance of CIU disease. So, many authors support the link among H. pylori eradication and clinical improvement of CIU, in a similar way that we report [55-59]. Successful eradication of H. pylori gastric infection is correlated with clinical improvement, but not with the severity of the chronic idiopathic urticaria symptoms. These findings strengthen the role of H. pylori in the maintenance of CIU disease and enhances the benefits of its eradication in the dermatological patients, even if gastric symptoms were absent. This study was performed at the Microbiology Section of Instituto de Biomedicina Dr. Jacinto Convit in Caracas, Venezuela and at the New York University Infectious Diseases Laboratories in New York, USA, and supported in part by the Millennium Scientific Initiative Grant 4572-B, American Society for Microbiology International Fellowship Award for Latin America 2004, Medical Research Service of the Department of Veterans Affairs and FONACIT Grant G2005000371. Metzger WJ (1997) Urticaria, angioedema and hereditary angioedema. In: Pattersen R, Grammer LC, Greenberger PA (eds.). Allergic Disease, diagnosis and management. Lippincott-Raven Publishers, Philadelphia, USA. Cooper KD (1991) Urticaria and angioedema: Diagnosis and evaluation. J Am Acad Dermatol 25: 166-174. Greaves M (2000) Chronic urticaria. J Allergy Clin Immunol 105: 664-672. Greaves MW (1995) Chronic urticaria. N Engl J Med 332:1767-1772. Champion RH (1990) A practical approach to the urticarial syndrome-a dermatologist’s view. Clin Exp Allergy 20: 221-224. Warren JR, Marshall B (1983) Unidentified curved bacilli on gastric epithelium in active chronic gastritis. Lancet 1: 1273-1275. IARC Monogr Eval Carcinog Risks Hum. Shistosomes, liver flukes and Helicobacter pylori. IARC Working group on the evaluation of carcinogenic risks to humans. Lyon, 7-14 June 1994. IARC Monogr Eval Carcinog Risks Hum 61: 1-241. Rudi J, Reuther S, Sieg A, Hoerner M, Stremmel W (2002) Relevance of underlying disease and bacterial vacA and cagA status on the efficacy of Helicobacter pylori eradication. Digestion 65: 11-15. Nomura AM, Pérez-Pérez GI, Lee J, Stemmermann G, Blaser MJ (2002) Relation between Helicobacter pylori cagA status and risk of peptic ulcer disease. Am J Epidemiol 155: 1054-1059. Toro C, Garcia-Samaniego J, Alarcón T, Baquero M (2003) [Association among anti-CagA antibody detection, antibiotic susceptibility, and peptic ulcer in patients with Helicobacter pylori infection]. Enferm Infecc Microbiol Clin 21: 137-141. Bommelaer G, Bruley Des Varannes S, Fléjou JF, Matysiak T, Poynard T, et al. (2001) [CagA status and virulence of Helicobacter pylori strains. Results of a French multicentric prospective study]. Gastroenterol Clin Biol 25: 1084-1089. Saruc M, Goksel G, Ozkaya S, Guclu F, Ozbakkaloglu B, et al. (2001) The effect of CagA status on response to Helicobacter pylori eradication therapy in Western Turkey. Braz J Med Biol Res 34: 1435-1439. Blaser MJ, Perez-Perez GI, Kleanthous H, Cover TL, Peek RM, et al. (1995) Infection with Helicobacter pylori strains possessing cagA is associated with an increased risk of developing adenocarcinoma of the stomach. Cancer Res 55: 2111-2115. Hatakeyama M (2003) Helicobacter pylori CagA as a potential bacterial oncoprotein in gastric carcinogenesis. Pathol Biol (Paris) 51: 393-394. Azuma T, Yamazaki S, Yamakawa A, Ito Y, Ohtani M, et al. (2003) The effects of cure of Helicobacter pylori infection on the signal transduction of gastric epithelial cells. Aliment Pharmacol Ther 1: 39-44. Shiotani A, Sakurane M, Furukawa F (2004) Helicobacter pylori-positive patients with pruritic skin diseases are at increased risk for gastric cancer. Aliment Pharmacol Ther 1: 80-84.
de Paz S, Rodríguez M, Santaolalla M, Fernández B, Herrera I, et al. (2000) Asma bronquial asociada a infección por Helicobacter pylori. Alergol Inmunol Clin 15: 43-44. Reinauer S, Megahed M, Goerz G, Ruzicka T, Borchard F, et al. (1995) Schönlein-Henoch purpura associated with gastric Helicobacter pylori infection. J Am Acad Dermatol 33: 876-879. Utaş S, Ozbakir O, Turasan A, Utaş C (1999) Helicobacter pylori eradication treatment reduces the severity of rosacea. J Am Acad Dermatol 40: 433-435. Ohtsuka T, Yamakage A, Yamazaki S (1999) A case of prurigo and lichenified plaques successfully treated with proton pump inhibitor. J Dermatol 26: 518-521. Di Campli C, Gasbarrini A, Nucera E, Franceschi F, Ojetti V, et al. (1998) Beneficial effects of Helicobacter pylori eradication on idiopathic chronic urticaria. Dig Dis Sci 43: 1226-1229. Kountouras J, Mylopoulos N, Konstas AG, Zavos C, Chatzopoulos D, et al. (2003) Increased levels of Helicobacter pylori IgG antibodies in aqueous humor of patients with primary open-angle and exfoliation glaucoma. Graefes Arch Clin Exp Ophthalmol 241: 884-890. De Koster E, De Bruyne I, Langlet P, Deltenre M (2000) Evidence based medicine and extradigestive manifestations of Helicobacter pylori. Acta Gastroenterol Belg 63: 388-392. Pattison CP, Marshall BJ (1997) Proposed link between Helicobacter pylori and sudden infant death syndrome. Med Hypotheses 49: 365-369. Kerr JR, Al-Khattaf A, Barson AJ, Burnie JP (2000) An association between Sudden Infant Death Syndrome (SIDS) and Helicobacter pylori infection. Arch Dis Child 83: 429-434. Torresa AM, Gaensly MM (2002) Helicobacter pylori: ¿un nuevo factor de riesgo cardiovascular? Helicobacter pylori: A new cardiovascular risk factor? Rev Esp Cardiol 55: 652-656. Kanwar AJ, Greaves MW (1995) Approach to the patient with chronic urticaria. Hosp Pract 31: 175-189.
shnaswamy G, Youngberg G (2001) Acute and chronic urticaria. Challenges and considerations for primary care physicians. Postgrad Med 109: 107-123. Gala Ortiz G, Cuevas Agustín M, Erias Martínez P, de la Hoz Caballer B, Fernández Ordoñez R, et al. (2001) Chronic urticaria and Helicobacter pylori. Ann Allergy Asthma Immunol 86: 696-698. Tsang KW, Lam SK (1999) Extragastroduodenal conditions associated with Helicobacter pylori infection. Hong Kong Med J 5: 169-74. Martîn-de-Argila C, Boixeda D, Cantón R, Gisbert JP, Fuertes A (1995) High seroprevalence of Helicobacter pylori infection in coronary heart disease. Lancet 29: 346-310. Vazquez M, Bermejo F, Boixeda D, Martin de Argila C, Lopez P, Boixeda P, et al. (2004) Chronic urticaria and Helicobacter pylori. Med Clin (Barc) 122: 573-575. Federman D, Kirsner R, Moriarty J, Concato J (2003) The effect of antibiotic therapy for patients infected with Helicobacter pylori who have chronic urticaria. J Am Acad Dermatol 49: 861-864. Wedi B, Wagner S, Werfel T, Manns MP, Kapp A (1998) Prevalence of Helicobacter pylori-associated gastritis in chronic urticaria. Int Arch Allergy Immunol 116: 288-294. Moreira A, Fonseca J, Rodrigues J, Vaz M. Is Helicobacter pylori infection associated with chronic idiopathic urticaria? Allergol Immunopathol (Madr) 2003 31: 209-214. Schnyder B, Helbling A, Pichler WJ (1999) Chronic idiopathic urticaria: Natural course and association with Helicobacter pylori infection. Int Arch Allergy Immunol 119: 60-63. Dauden E, Jimenez-Alonso J, Garcia-Diez A (2000) Helicobacter pylori and idiopathic chronic urticaria. Int J Dermatol 39: 446-452. Rebora A, Drago F, Parodi A (1995) May Helicobacter pylori be important for dermatologist? Dermatology 191: 6-8. Boni R, Burg G, Wirth HP (2000) Helicobacter pylori and skin diseases a (still) intact myth? Schweiz Med Wochenschr 130: 1305-1308. Atta AM, Rodrigues MZA, Sousa CP, Medeiros Júnior M, Sousa-Atta ML (2004) Autoantibody production in chronic idiopathic urticaria is not associated with Helicobacter pylori infection. Braz J Med Biol Res 37: 13-17. Höök-Nikanne J, Varjonen E, Harvima RJ, Kosunen TU (2000) Is Helicobacter pylori infection associated with chronic urticaria? Acta Derm Venereol 80: 425-426. Chivato T, Gómez S, Lavin J, Mateos J, Laguna R (2000) Helicobacter pylori y urticaria crónica idiopática. Alergol Inmunol Clin 15: 43. Ozkaya-Bayazit E, Demir K, Ozguroglu E, Kaymakoglu S, Ozarmagan G (1998) Helicobacter pylori eradication in patients with chronic urticaria. Arch Dermatol 134: 1165-1167. Cavazza ME, Correnti M, Urrestarazu MI, Vivas JV, Perrone M, Serrano N, et al. (2001) Helicobacter pylori infection in Venezuela. Clin Microbiol Inf 7: 331. Marcano L MJ, Urrestarazu MI, Serrano N (2003) Helicobacter pylori en Dermatología. Breve revisión de la literatura. DermVenz 41: 3-7. Perez-Perez GI, Sack RB, Reid R, Santosham M, Croll J, et al. (2003) Transient and persistent Helicobacter pylori colonization in native American children. J Clin Microbiol 41: 2401-2407. Kolibasova K, Cervenkova D, Hegyi E, Lengyelova J, Toth J (1994) Helicobacter pylori: ein möglicher ätiologischer faktor del chronischen Urticaria. Dermatosen 42: 235-236. Bohmeyer J, Heller A, Hartig C, Wetenberger-Treumann M, Huchzermeyer H, et al. (1996) [Association of chronic urticaria with Helicobacter pylori-induced antrum gastritis]. Hautarzt 47: 106-108. Fukuda S, Shimoyama T, Umegaki N, Mikami T, Nakano H, et al. (2004) Effect of Helicobacter pylori eradication in the treatment of Japanese patients with chronic idiopathic urticaria. J Gastroenterol 39: 827-830. Chiu YC, Tai WC, Chuah SK, Hsu PI, Wu DC, et al. (2013) The clinical correlations of Helicobacter pylori virulence factors and chronic spontaneous urticaria. Gastroenterol Res Pract 2013: 436727. Magen E, Delgado JS (2014) Helicobacter pylori and skin autoimmune diseases. World J Gastroenterol 20: 1510-1516. Mogaddam MR, Yazdanbod A, Ardabili NS, Maleki N, Isazadeh S (2015) Relationship between Helicobacter pylori and idiopathic chronic urticaria: Effectiveness of Helicobacter pylori eradication. Postepy Dermatol Alergol 32: 15-20. Persechino S, Annibale B, Caperchi C, Persechino F, Narcisi A, et al. (2012) Chronic idiophatic urticaria and Helicobacter pylori: A specific pattern of gastritis and urticaria remission after Helicobacter pylori eradication. Int J Immunopathol Pharmacol 25: 765-770. Gu H, Li L, Gu M, Zhang G (2015) Association between Helicobacter pylori Infection and chronic urticaria: A Meta-Analysis. Gastroenterol Res Pract 2015: 486974. Kutlubay Z, Zara T, Engin B, Serdaroˇglu S, Tüzün Y, et al. (2014) Helicobacter pylori infection and skin disorders. Hong Kong Med J 20: 317-324. Curth HM, Dinter J, Nigemeier K, Kütting F, Hunzelmann N, et al. (2015) Effects of Helicobacter pylori eradication in chronic spontaneous urticaria: Results from a retrospective cohort study. Am J Clin Dermatol 16: 553-558. Graphic 1: Variation of CagA and WC OD values in response to therapeutic intervention. Graphic 2: Variations in the immune response to CagA and WC in 12 H. pylori-positive patients with urticaria initial score < 10 points. Table 1:Scale for evaluation of the severity of symptoms & classification in symptomatic categories. Table 2: Initial score groups. Table 3: Population general and serologic characteristics. Table 4: CIU symptoms severity according to UBT status and mean values of UBT and serology. Table 5: Relation between serologic markers and UBT results. Table 6: Clinical improvement and WC and CagA variations. Table 7: Symptoms severity according to UBT status and mean values of UBT and serology. Post therapeutic intervention. Citation: Marcano-Lozada M, Cavazza ME, Perez-Perez G, Urrestarazu MI, Serrano N, et al. (2018) Association among Helicobacter pylori Gastric Infection Eradication and Chronic Idiopathic Urticaria Improvement in Venezuelan Patients. Adv Microb Res 2: 004. Copyright: © 2018 Marcano-Lozada M, et al. This is an open-access article distributed under the terms of the Creative Commons Attribution License, which permits unrestricted use, distribution, and reproduction in any medium, provided the original author and source are credited.